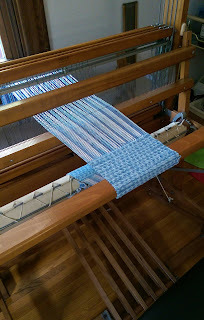 Weaving the dishcloths made me aware of a few changes I'd like to make, and they are all complete now. First, the original tie-ups weren't all the same length, and even if they were, because of levers and angles and stuff, the treadles wouldn't lift the shafts equally. So I bought some texsolv and pegs and rigged my own system. It works great. 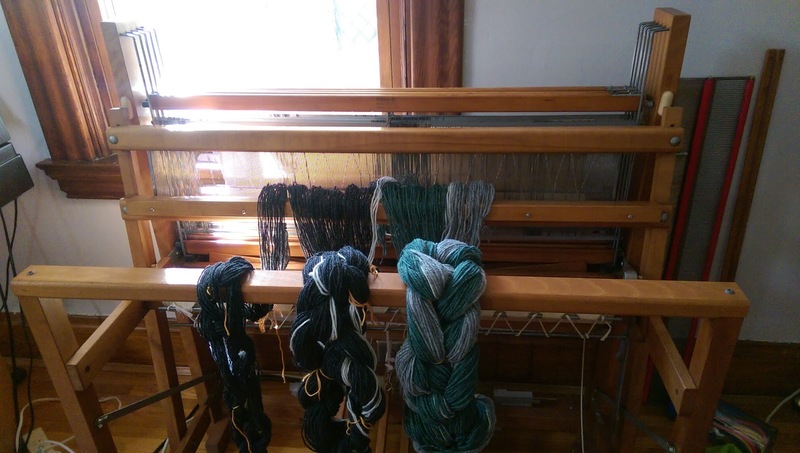 I ended up just cleaning the heddles with steel wool. I have 100 on each shaft, and I'll keep working on cleaning more while watching tv or whatever. I just hate to waste something that is usable with some time and effort (this also applies to the reeds). 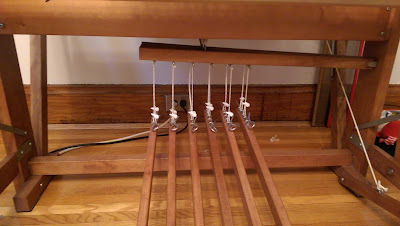 I unscrewed two of the heddle bar connectors to loosen the bars and make moving the heddles easier. I re-laced the front and back apron rods. Much better. I replaced the bumpers on the beater, and adjusted them so that they actually clear the screw heads on the sides of the frame. It doesn't seem like they ever worked (the old ones were pretty beat up), and maybe the design was improved on later versions, but the replacement bumpers weren't any deeper, so I can't say for sure. I bought a 24" stool from BB&B. It's not your typical weaving bench, but it's tall enough, and wasn't $300. 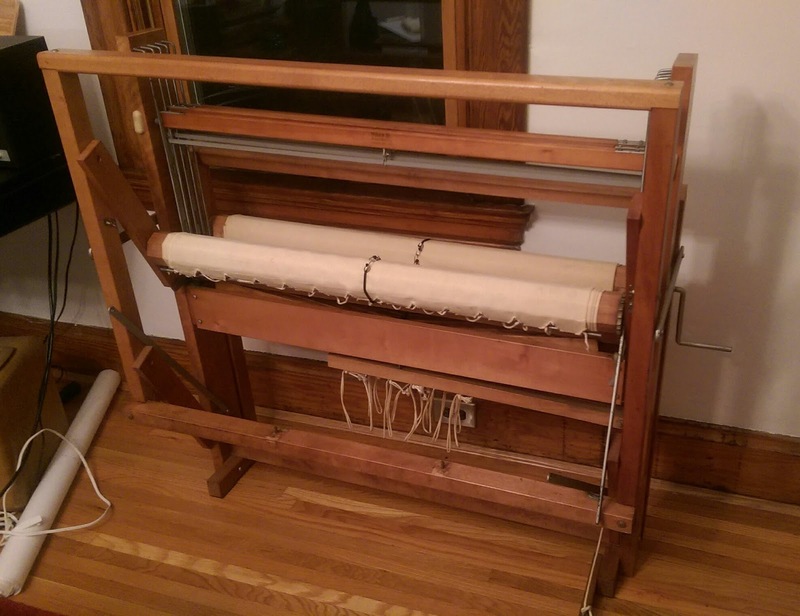 And now I'm ready to make the class project for the Craftsy class "Floor Loom Weaving". I don't think I'm going to make it into pillows, but maybe I'll sew the panels together into a throw. The 10 dent reed seems to have the yarn pretty close, and it rubs some. It's the prescribed yarn, so that must be how it should be. I used blind slats for the packing. 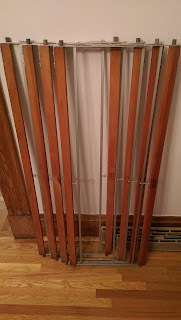 I ran out, and they aren't very stiff, so while adequate for some projects, I'll probably get some better warp sticks when I get the chance. Finally. 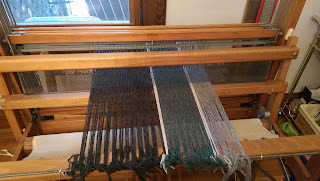 The loom is making woven stuff. I cleaned the 6 dent reed with scotch-brite pads, which worked pretty well. I went head and used some dull gray heddles, and things are cookin'. 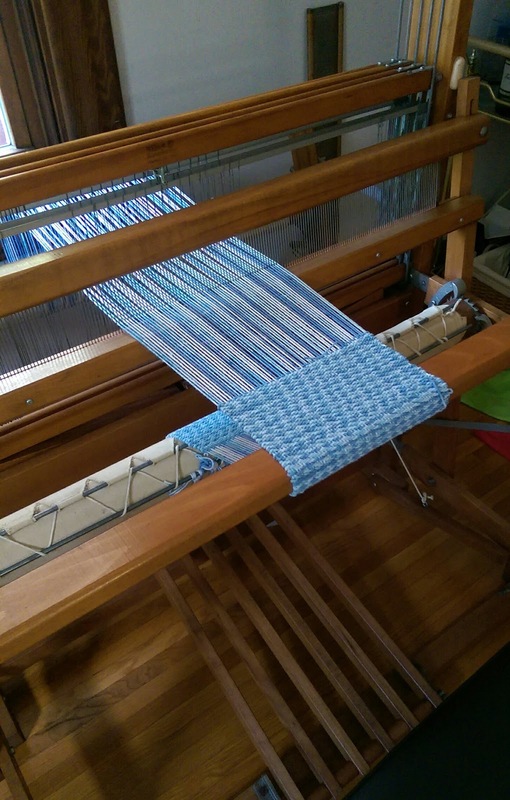 Warping went mostly smoothly. 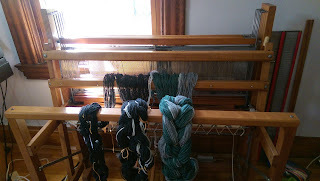 It helps to have warped a rigid-heddle loom before, and to have watched hours and hours of other people warping looms. I don't have a raddle, so I warped front to back, which works well also because the back beam folds down all the way to the floor, and you can sit on a stool right up against the heddles. 1. I think the shafts might be warped a little bit, and it makes the heddles hard to move. 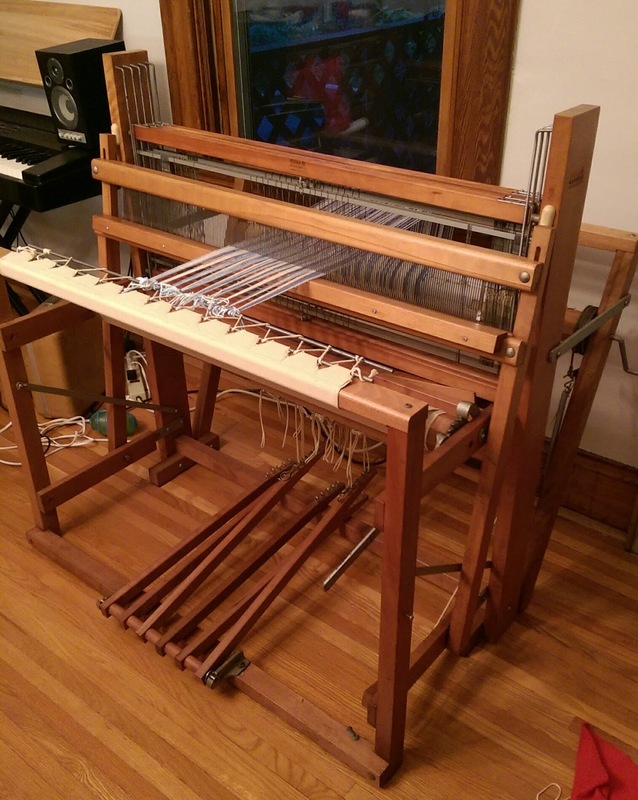 Solutions may be to a) not hook the heddle rods on the center hooks until done threading, b) try to un-warp the shafts, and c) unscrew the heddle rod hooks a little bit to loosen things up. New heddle rod hooks that are adjustable are $10 each (I would need eight) so that's not ideal. 2. The tie-ups are all the same length, but probably shouldn't be. I'm thinking of changing them to texsolv so I can adjust easily (the current set up is loops with overhand knots). 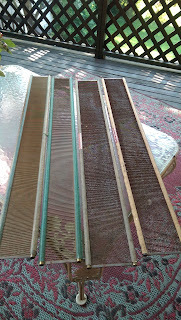 However, I might just be being picky to have all of the shafts raise to the same level, if the weaving is fine anyway. 3. I am going to re-lash the apron rod on the front. I didn't mind that it was heavy, but I would have liked more room to get my fingers in there when tying on. The back apron rod is held on with a few random threads, so redoing that was in the plans already. I ordered some nylon cord from Camilla Valley Farm, but not enough. Once it arrives, I'll take it around and shop for something similar in a craft or hardware store. 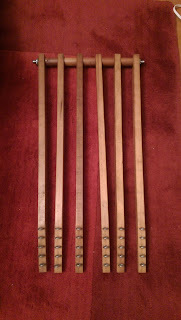 Also, the apron rods are rough, so I'll sand them like I did the metal rods that guide the shafts. It would be nice if they would turn, and they don't. 4. I might need something else to sit on. I like the height of my piano bench with a book on it, but that's not a great long-term option. Ouch! 5. Using a drill to wind bobbins is perfectly acceptable. My drill will go pretty slowly, so I can maintain control and not burn my fingers with yarn friction. Certainly more affordable than a bobbin winder. Those things are expensive! Not a lot of progress has been made since the last post, but I've certainly done a lot of work! Cleaning metal things is not very straightforward, at least loom parts. Heddles are delicate and fiddly, and reeds need to be cleaned pretty well to ensure they don't get rust and oxidation on the threads. 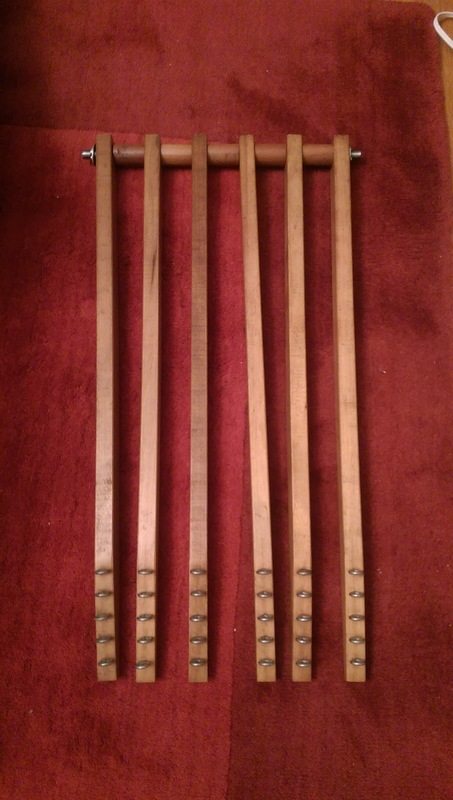 These are the four reeds that came wit the loom. The two narrower reeds (on the left) are LeClerc reeds, and the two wider ones are from what I believe is a defunct reed company. They all have their original papers along the edges, and they will all have shiny new "duck" tape when this is all over. 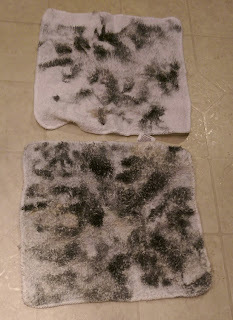 Last weekend I tried some different things to clean them, but nothing's working great. Someone on the internet recommended a fabric buffing wheel, that it would get in between the dents, but I didn't have great luck with that. The two that are truly rusty I've dosed with a lot of WD-40, and one of them I scrubbed with a brass brush, which seemed to remove a lot of rust, but was far from complete. So I moved on to the two LeClerc reeds which weren't in as bad of shape. The second from the left is a 6-dent reed, so the spaces between the dents are pretty big. I tried scrubbing this with yarn and Barkeeper's Friend, which worked ok. If I only had a few dents to do it would be great. But it was really messy and not super fast so I put that one aside. 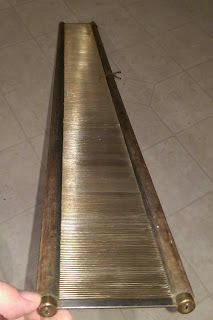 The left-most reed is a 15 dent reed, so there is no way I could/would go dent-by-dent to clean it. I was just going to have to rub hard enough with a terry-cloth towel to get in there. I used some MAAS metal polish and rubbed and rubbed and rubbed. This is the oxidation that came off. The darker cloth is just as dark on the other side. I feel like I made a lot of progress on that one. There are a few little stubborn spots that won't budge. I tried a little fine sandpaper, but it wasn't fine enough, so those spots are a little rough. I think I need some fine steel wool. This reed had a piece of string tied in the center dent (it's still there in the picture), and where the knot and ends rested against the metal there is an imprint that I can't get rid of. Next thing to try: I bought a wire wheel that I'm going to take to the rusty reeds. If that doesn't work, I might just give up on those two. I might also get some CLR to try on the 6 dent reed. Again, someone on the internet had good luck with it. It's worth a try. The heddles have been a similar story. 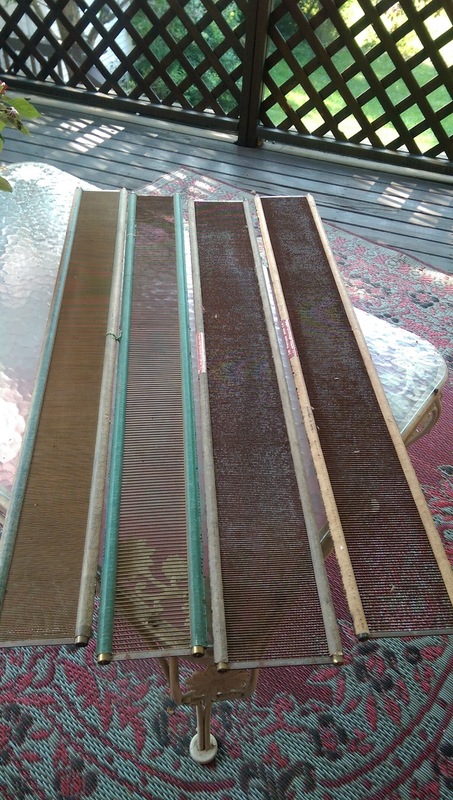 I found that if I took the heddles out of the coke bath and let them dry, the oxidation wouldn't rub off, but if I rubbed them wet, a lot would come off. So I cleaned off about 200 and was done with that. They don't look great. They look dull gray. I think it's ok, but they're not slippery, and since I think it's my fault (I put them in the oven to speed up the acid bath, and that's when they turned gray) I'm inclined to try to clean them instead of buying new. I'll probably buy new ones over time as I go. I would like to have Texsolv heddles, but they are pretty expensive. I polished some heddles with MAAS during class this week* but didn't get far. I'm sure by next week I'll be posting a picture of my lovely new texsolv heddles. Next week I'm going on a trip for work, and since I drive a Prius, the money I get for mileage far exceeds my actual expenses. It'll be hard to not spend that money on heddles, I feel. Maybe a reed, too. *I am working on my Master's via internet at University of Illinois. Class is a live lecture, but I'm sitting at my dining room table, and it helps me to have something to do with my hands as I listen. 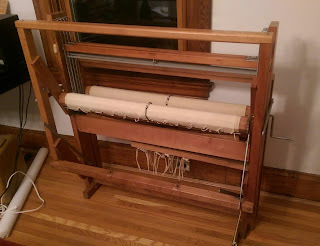 Tonight I cleaned and Fed-and-Waxed the main body of the loom, and moved it into it's new space. I replaced the harnesses, but haven't yet put back the beater or treadles. The heddles are still soaking in diet coke. I'm not looking forward to wiping them off one at a time. Procrastination! The reeds are still on the porch. I haven't smelled them lately. The longer I wait, the better the news, I feel, so I might be somewhat intentionally ignoring them. I determined that this evening I would finish something, anything. I didn't have any other commitments, so it seemed a reasonable goal. Here are the harnesses, with far less rust, and nearly no musty smell! If I had been thinking, I would have taken before shots, but I wasn't at the time I took this apart. You'll just have to take my word for it.